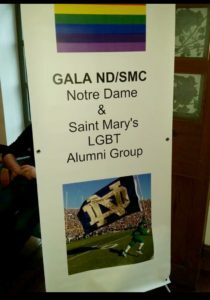 GALA ND/SMC held our 2nd Annual NYC Alumni Fall Weekend in early October, 2016. Over the course of the weekend, alumni and friends were treated to a variety of events ranging from a small dinner at a quiet Italian Bistro, a fun game-watch in Hells Kitchen to the two signature events. For a recap of the weekend including pictures, go to NYC Events, LGBT Pilgrimage of Mercy and 2016 NYC Student Scholarship Benefit.